Indian Air Force issued an official notification related to the AFCAT Exam 2019. 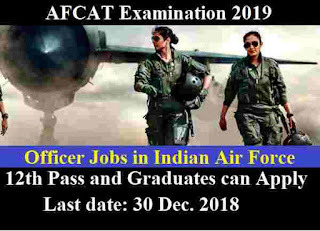 Indian Air Force Recruitment department conducts this AFCAT examination every year to recruit fresher Indian candidates for various job profiles. Indian Air Force calls all fresher Indian people Men as well as Women to be part of this elite force as Group A Gazetted Officers in Flying and Ground Duty (Technical and Non-Technical) branches. The Online Written examination will be conducted on 16 Feb 19 and 17 Feb 19 for this AFCAT exam 2019. Applicants applying for this AFCAT examination should ensure that they full fill all the suitability criteria for the admission to the written examination. Their admission at all the stages of examination viz. Written examination and SSB test will be purely provisional, subject to their satisfying the prescribed eligibility conditions. If on verification at any time before or after the written examination or AFSB Testing, it is found that they do not fulfil any of the eligibility conditions, their candidature will be cancelled by the IAF. 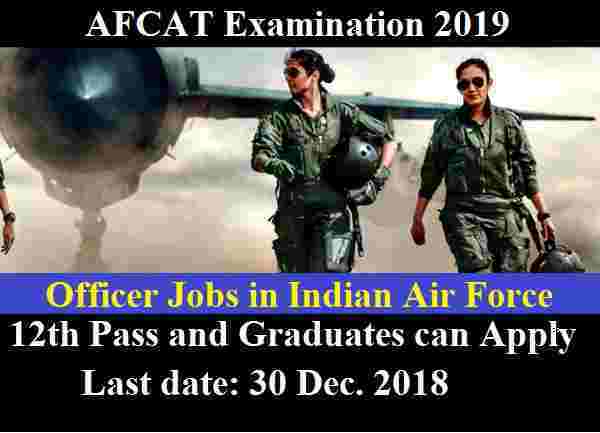 More information related to this AFCAT Examination 2019 is given below in this article. Read the whole article carefully to know more about this Indian Air Force Recruitment process 2019. Examination Name: AFCAT Exam 2019. Vacancies to be Filled: 163 Posts. Pay Band: Rs.56,100 -Rs.110,700 per Month. Join Indian Air Force as a Technical which is Group-X and Non-Technical which is Group-Y Posts. 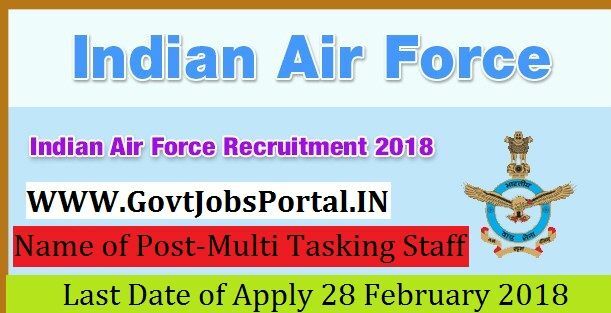 Air force Recruiter is inviting all Indian unmarried candidates to apply for these Air force jobs 2018. Indian Air force recruitment department issued this type of recruitment notification time to time for filling up the vacant positions of Group-X and Group-Y in various Air Force station in India. Indian Airforce Recruitment department is going to conducts online examination for the selection of the candidates, the online examination will be held on 13-16 September 2018. Those who want to join Indian Air force as a technical or non-technical person can apply for this Indian Air Force Recruitment 2018. This is the best opportunity to serve your nation by serving Indian defence forces. Air Force recruiter is inviting all Indian candidates for these Air Force jobs. More information about this Indian Airforce recruitment is given below in this post. Read the complete article before moving to online application for applying these Air force jobs. Join Indian Air Force through AFCAT 2018. Indian Airforce Recruitment department issued a notification in PDF format in which they said that they are going to conduct AFCAT 2018 examination in the month of Aug./Sept 2018. 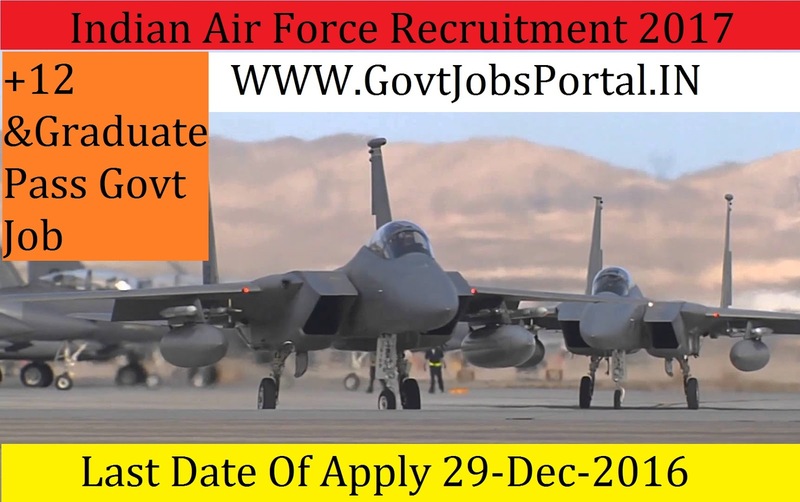 Those who are looking for Air force jobs from long time after completing their Graduation in any stream can now apply for this Indian air force recruitment 2018. By joining Indian Air force anyone from us can easily serve the nation by devoting himself/herself. Indian Air force conducts this AFCAT Examination every year. Indian Airforce recruitment department is going to fill up 182 officers posts through this AFCAT Exam 2018. Below in this article we shared the detailed information about these air force jobs in India. First of all we are going to explain the basic information related to this AFCAT Exam 2018. Those who are wishing to apply for these Air force jobs must know the basic detail before applying this Indian Air Force recruitment 2018. This information contains number of vacancies, job profiles and pay band related to the job profile. Check the table below for more information about this Indian Airforce recruitment 2018. Indian Air Force is going to recruit fresher candidates in India for Multi Tasking Staff, House Keeping Staff Posts. So, those candidates who are willing to work with this organization they May apply for this post. Last Date of Apply 28-February-2018. Total numbers of vacancies are 22 Posts. Only those candidates are eligible who have passed Matriculation Pass or equivalent qualification from a recognized University or Board. Indian citizen having age in between 18 to 25 years can apply for this Indian Air Force Recruitment 2018. Those who are interested in these Indian Air Force jobs in India and meet with the whole eligibility criteria related to these Indian Air Force job below in the same post. Read the whole article carefully before applying. Educational Criteria: Only those candidates are eligible who have passed Matriculation Pass or equivalent qualification from a recognized University or Board. What is the Air Force Selection Process job? 1: Selection will be held on Test. 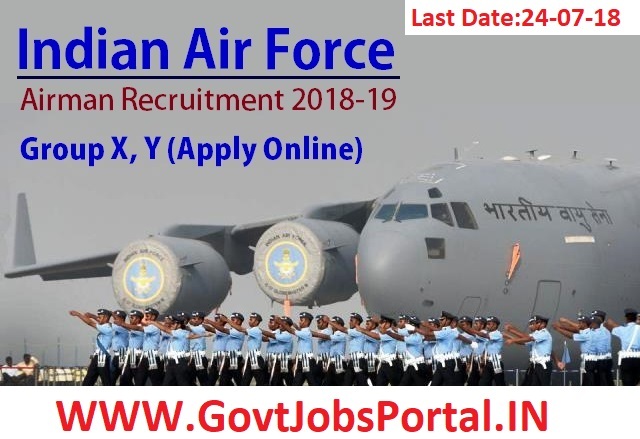 Indian Air Force is going to recruit fresher candidates in India for Airman Group X (Technical) Trades & Airman Group Y (Non-Technical) Trades Posts. So, those candidates who are willing to work with this organization they May apply for this post. Last Date of Apply 12-January-2018. Total numbers of vacancies are Not Mention. Only those candidates are eligible who have passed Intermediate/10+2/ Equivalent examination with Mathematics, Physics and English with minimum 50% marks in aggregate and 50% marks in English or Passed Three years Diploma Course in Engineering in any stream. Indian citizen having age in between 16 to 26 years can apply for this Indian Air Force Recruitment 2018. Educational Criteria: Only those candidates are eligible who have passed Intermediate/10+2/ Equivalent examination with Mathematics, Physics and English with minimum 50% marks in aggregate and 50% marks in English or Passed Three years Diploma Course in Engineering in any stream. Age Criteria: Candidates age limit should to be possess minimum age 16 years & maximum age 26 years. What is the Process for Selection this Air Force job? 2: Selection will be held on Physical Test. 3: Selection will be held on Medical Test. 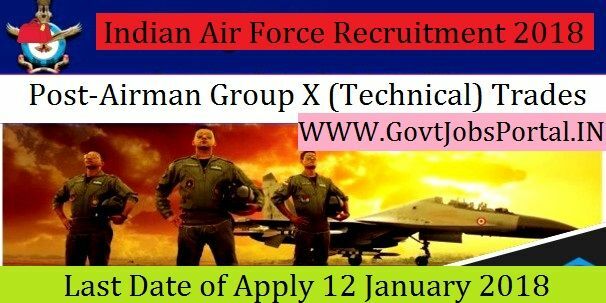 Indian Air Force is going to recruit fresher candidates in India for Airman Group X (Technical) Trades & Airman Group Y (Non-Technical) Posts. So, those candidates who are willing to work with this organization they May apply for this post. Last Date of Apply 06-November-2017. Total numbers of vacancies are Not Mention. Only those candidates are eligible who have passed Intermediate/ Equivalent examination with Mathematics, Physics and English with minimum 50% marks in aggregate and 50% marks in English or Passed Three years Diploma Course in the following streams from a Government recognized Polytechnic Institute with 50% marks in aggregate, and 50% marks in English in Diploma or in Intermediate/ Matriculation. Indian citizen having age in between 18 to 28 years can apply for this Indian Air Force Recruitment 2017. Educational Criteria: Only those candidates are eligible who have passed Intermediate/ Equivalent examination with Mathematics, Physics and English with minimum 50% marks in aggregate and 50% marks in English or Passed Three years Diploma Course in the following streams from a Government recognized Polytechnic Institute with 50% marks in aggregate, and 50% marks in English in Diploma or in Intermediate/ Matriculation. 4: Selection will be held on Medical Test. 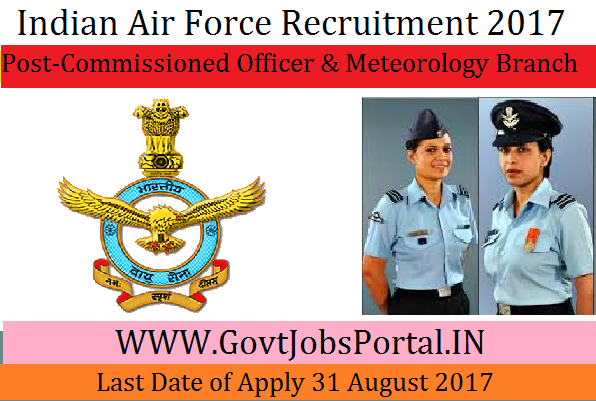 Indian Air Force is going to recruit fresher candidates in India for Commissioned Officer in NCC Special Entry & Meteorology Branch Posts. So, those candidates who are willing to work with this organization they May apply for this post. Last Date of Apply 31-August-2017. Total numbers of vacancies are Not Mention. Only those candidates are eligible who have passed Post Graduate Degree in any Science stream / Mathematics / Statistics / Geography / Computer Applications/ Environmental Science / Applied Physics /Oceanography / Meteorology / Agricultural Meteorology/ Ecology & Environment / Geo-physics / Environmental Biology with minimum of 50% marks in aggregate. Indian citizen having age in between 20 to 26 years can apply for this Indian Air Force Recruitment 2017. Those who are interested in these Indian Air Force jobs in India and meet with the whole eligibility criteria related to these Indian Air Force jobs below in the same post. Read the whole article carefully before applying. Vacancies Filled Under this Indian Air Force Recruitment 2017: Not Mention. Educational Criteria: Only those candidates are eligible who have passed Post Graduate Degree in any Science stream / Mathematics / Statistics / Geography / Computer Applications/ Environmental Science / Applied Physics /Oceanography / Meteorology / Agricultural Meteorology/ Ecology & Environment / Geo-physics / Environmental Biology with minimum of 50% marks in aggregate. Age Criteria: Candidates age limit should to be possess minimum age 20 years & maximum age 26 years. 2: Selection will be held on Group Test. Indian Air Force Afcat Exam2017 is going to recruit fresher candidates in India for Flying Branch , Ground Duty Branch Posts. So, those candidates who are willing to work with this organization they May apply for this post. Last Date of Apply 29-June-2017. Total numbers of vacancies are Not Mention. Only those candidates are eligible who have passed Graduate (Three Year Course) in any discipline from a recognized University (with Physics and Mathematics at 10+2 level) / BE / B Tech Four Year Course & Final Year/semester students are also eligible to apply, provided they produce Degree certificate issued by the University as per the date stipulated in the advertisement. Indian citizen having age in between 20 to 26 years can apply for this Indian Air Force Afcat Exam2017 Recruitment 2017. Those who are interested in these Indian Air Force Afcat Exam2017 jobs in India and meet with the whole eligibility criteria related to these Indian Air Force Afcat Exam2017 job below in the same post. Read the whole article carefully before applying. Educational Criteria: Only those candidates are eligible who have passed Graduate (Three Year Course) in any discipline from a recognised University (with Physics and Mathematics at 10+2 level) / BE / B Tech Four Year Course & Final Year/semester students are also eligible to apply, provided they produce Degree certificate issued by the University as per the date stipulated in the advertisement. 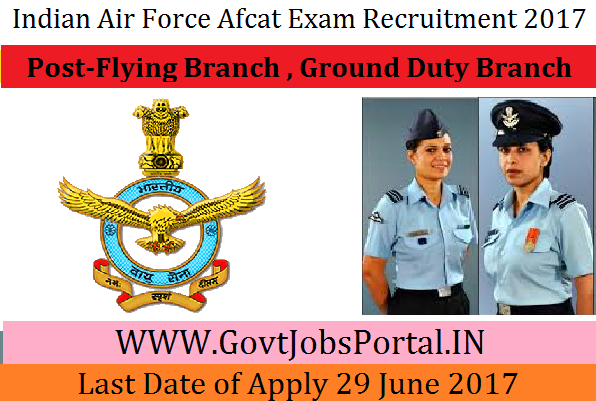 Indian Air Force NCC Special Entry is going to recruit fresher candidates in India for Flying Branch Posts. So, those candidates who are willing to work with this organization they May apply for this post. Last Date of Apply 15-June-2017. Total numbers of vacancies are Not Mention. Only those candidates are eligible who have passed Graduates with minimum three year degree course in any discipline from a recognized University who have attained minimum 60% marks or equivalent and have passed Maths & Physics at 10+2 level or BE/B Tech degree (Four year course). Indian citizen having age in between 20 to 26 years can apply for this Indian Air Force NCC Special Entry Recruitment 2017. Those who are interested in these Indian Air Force NCC Special Entry jobs in India and meet with the whole eligibility criteria related to these Indian Air Force NCC Special Entry job below in the same post. Read the whole article carefully before applying. Educational Criteria: Only those candidates are eligible who have passed Graduates with minimum three year degree course in any discipline from a recognized University who have attained minimum 60% marks or equivalent and have passed Maths & Physics at 10+2 level or BE/B Tech degree (Four year course). 4: Selection will be held on Physical Test. The Indian Air Force is the air arm of the Indian armed forces. It is the world's fourth largest air force in terms of both personnel and aircraft. Its primary responsibility is to secure Indian airspace and to conduct aerial warfare during a conflict. . Indian air force is going to recruit fresher candidates in India for Air Force Common Admission Test, Flying, and Ground Duty Posts. So, those candidates who are willing to work with this organization they May apply for this post on or before 29-Dec-2016. Total numbers of vacancies are Not Mention. Only those candidates are eligible who have a Graduates (Minimum three year degree course) in any discipline from a recognized University who have attained minimum 60% marks or equivalent and have passed Math & Physics at 10+2 level or BE / B Tech degree (Four year course) or cleared section A & B examination of Associate Membership of Institute Engineers (India) or Aeronautical Society of India from a recognized University with minimum 60% marks or equivalent. Indian citizen having age in between 20 to 26 years can apply for this IAF Recruitment 2017. Those who are interested in these IAF jobs in India and meet with the whole eligibility criteria related to these IAF job below in the same post. Read the whole article carefully before applying these India job.